Arthropod-borne viruses (arboviruses) have become significant public health problems, with the emergence and re-emergence of arboviral diseases nearly worldwide. The most populated Southeast Asia region is particularly vulnerable. The arboviral diseases such as dengue (DEN), Japanese encephalitis (JE), West Nile virus (WNV), chikungunya fever (CHIK), hemorrhagic fevers such as Crimean-Congo hemorrhagic (CCHF) fever, Kyasanur forest disease virus (KFDV), etc. are on the rise and have spread unprecedentedly, causing considerable burden of disease. 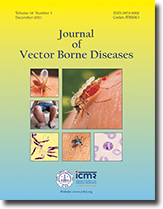 The emergence/re-emergence of these diseases is associated with complex factors, such as viral recombination and mutation, leading to more virulent and adaptive strains, urbanization and human activities creating more permissive environment for vector-host interaction, and increased air travel and commerce. Climate is a major factor in determining the geographic and temporal distribution of arthropods, the characteristics of arthropod life cycles, the consequent dispersal patterns of associated arboviruses, the evolution of arboviruses; and the efficiency with which they are transmitted from arthropods to vertebrate hosts. The present and future arboviral threats must be mitigated by priority actions such as improving surveillance and outbreak response, establishing collaboration and communication intersectorally, and strengthening the prevention and control programmes along with improving biosafety aspects with regards to highly infectious nature of these arboviral diseases. Evidence from research needs to be generated and priority areas for research defined. Background & objectives: Malaria is the major cause of morbidity and mortality in sub-Saharan Africa. A child below five years dies after every 30 min. Highland areas under land use change impact on malaria transmission by altering the microclimate of the immature stages and adult mosquitoes. Adult vector population dynamics is important because it is an indicator of transmission risk of the disease. This study was to investigate the effects of microclimatic changes on the mosquito indoor-resting behavior. Methods: The study was conducted at a highland site of Marani and at a lowland site of Kombewa where 30 houses were randomly selected at either site. Outdoor and indoor weather conditions were monitored throughout the study period. Indoor mosquitoes were collected using the pyrethrum spray catch method, gonotrophic stage of the females determined and species identified to species level using rDNA polymerase chain reaction method. ELISA was carried out to determine the Plasmodium sporozoites in mosquitoes. Results: Anopheles gambiae s.s. was more abundant at the highland site whereas An. funestus at the lowland site. Indoor densities were highest in June 2003 at both the sites: An. gambiae at the highland site and An. funestus at the lowland site. There was an association between An. gambiae s.s. abundance and relative humidity at the highland site. Combined entomological inoculation rate (EIR) for both the vector species was 0.4 infected bite per year (ib/yr) at the highland site and 31.1 ib/yr at the lowland site. Prolonged indoor spraying with insecticide decreased vector indoor abundance. Background & objectives: Cysteine proteases (falcipains), a papain-family of enzymes of Plasmodium falciparum, are responsible for haemoglobin degradation and thus necessary for its survival during asexual life cycle phase inside the human red blood cells while remaining non-functional for the human body. Therefore, these can act as potential targets for designing antimalarial drugs. The P. falciparum cysteine proteases, falcipain-II and falcipain- III are the enzymes which initiate the haemoglobin degradation, therefore, have been selected as targets. In the present study, we have designed new leupeptin analogues and subjected to virtual screening using Glide at the active site cavity of falcipain-II and falcipain-III to select the best docked analogues on the basis of Glide score and also compare with the result of AutoDock. The proposed analogues can be synthesized and tested in vivo as future potent antimalarial drugs. Methods: Protein falcipain-II and falcipain-III together with bounds inhibitors epoxysuccinate E64 (E64) and leupeptin respectively were retrieved from protein data bank (PDB) and latter leupeptin was used as lead molecule to design new analogues by using Ligbuilder software and refined the molecules on the basis of Lipinski rule of five and fitness score parameters. All the designed leupeptin analogues were screened via docking simulation at the active site cavity of falcipain-II and falcipain-III by using Glide software and AutoDock. Results: The 104 new leupeptin-based antimalarial ligands were designed using structure-based drug designing approach with the help of Ligbuilder and subjected for virtual screening via docking simulation method against falcipain-II and falcipain-III receptor proteins. The Glide docking results suggest that the ligands namely result_037 shows good binding and other two, result_044 and result_042 show nearly similar binding than naturally occurring PDB bound ligand E64 against falcipain-II and in case of falcipain-III, 15 designed leupeptin analogues having better binding affinity compared to the PDB bound inhibitor of falcipain-III. The docking simulation results of falcipain-III with designed leupeptin analogues using Glide compared with AutoDock and find 80% similarity as better binder than leupeptin. Interpretation & conclusion: These results further highlight new leupeptin analogues as promising future inhibitors for chemotherapeutic prevention of malaria. The result of Glide for falcipain-III has been compared with the result of AutoDock and finds very less differences in their order of binding affinity. Although there are no extra hydrogen bonds, however, equal number of hydrogen bonds with variable strength as compared to leupeptin along with the enhanced hydrophobic and electrostatic interactions in case of analogues supports our study that it holds the ligand molecules strongly within the receptor. The comparative e-pharmacophoric study also suggests and supports our predictions regarding the minimum features required in ligand molecule to behave as falcipain- III inhibitors and is also helpful in screening the large database as future antimalarial inhibitors. Background & objectives: Mosquitoes increased resistance to insecticides, and environmental concerns about the use of insecticides, pose a major challenge in the search for new molecules to deplete and incapacitate mosquito populations. Plants are the valuable source as practices consisting in exploiting plant materials as repellents, and are still in wide use throughout developing countries. The aim of the present study was to screen plants from Cτte d'Ivoire for larvicidal activity against mosquitoes. Methods: Resistant and sensitive larvae (III and IV instar) of Anopheles gambiae and Culex quinquefasciatus were exposed to crude ethanol extracts (90%) of 45 plants and viability observed after 30 min, 6, 12 and 24 h postincubation. After partition of active extracts, each fraction (hexane and chloroform washed with NaCl 1%, tannins and aqueous) was tested using the same protocol at various concentrations (1000– 31.2 ppm). Results: Of 49 extracts tested, 7 exhibited high potential (LC50 = 80 to 370 ppm) against resistant and sensitive III and IV instar larvae of An. gambiae and Cx. quinquefasciatus. These extracts were from Cissus populnea, Cochlospermum planchonii, Heliotropium indicum, Phyllanthus amarus, Vitex grandifolia and Alchornea cordifolia. However, three most active plant species (LC50 = 80– 180 ppm) were Cs. populnea, Cm. planchonii and P. amarus Their hexane and chloroform fractions showed high larvicidal activity. Conclusion: This study demonstrated that plants from Cτte d'Ivoire have a real potential for malaria, yellow fever, filarial and dengue vector control. Those could be used as sources or provide lead compounds for the development of safe plant-based biocides. Background & objectives: Taxonomic status of Culex pipiens is well-known as many years with such a wide variety of morphological and biological characteristics. These changes have been the subject of extensive investigation by many researchers. There are a little information about the morphology and molecular data of Cx. pipiens complex in Iran. The taxonomic status of the complex is very important because of medical and veterinary importance and wide distribution in the country. Methods: This study was carried out in 11 areas in Iran using dipping technique from April 2009 to October 2010. Molecular study was carried out using primers F1457 as forward and B1256 as reverse, which amplified Ace.2 gene and performed PCR-RFLP using ScaI restriction enzyme. Results: Culex quinquefasciatus found in south to central areas of Iran and reported as sympatric with Cx. pipiens in the central regions. Culex pipiens distributed in many areas of the country. Sequencing alignment of Ace.2 gene of Cx. quinquefasciatus and Cx. pipiens showed 6.5% variation in 46bp, especially in intron locus of gene. Culex pipiens complex from Iran are located in two separate clades with sister branches using phylogenetic sequencing tree. Interpretation & conclusion: The male genitalia found as the most reliable diagnostic characters for identification of Cx. pipiens complex in Iran that confirmed by amplify the Ace.2 gene in the samples but we recommended the use of sequencing PCR products of microsatellite loci and COI gene in future study. Background & objectives: The Meghalaya region had been considered free of malaria, but recently malaria cases in the foothills and valley areas raised concern that malaria transmission at high elevations may be increasing. This increase is associated with land use and land cover (LULC) changes. This LULC directly modifies larval habitats and affect the anopheline larval distribution patterns. Methods: In this survey, effects of LULC changes on the distribution of anopheline larval habitats in Meghalaya over a three year period (April 2008 to March 2011) was observed. Mosquito density and diversity of neighbouring four villages located along natural swamps (less disturbed) were compared with 16 villages located near disturbed area (cultivated area, urban area, pastures land area and national highway area). Results: The association between LULC type and occurrence of anopheline larvae was statistically significant. The distribution of anopheline positive habitats varied significantly between seasons. The mean density of Anopheles was significantly higher in urban area in all the seasons, but higher in farm land and pasture land areas only in rainy and post-rainy seasons. The six most common species collected were Anopheles maculatus (19.2%), An. vagus (13.7%), An. annularis (9.1%), An. philippinensis (8.1%), An. barbirostris (5.1%) and An. minimus (4.6%). LULC changes occurred mainly in valleys and National Highway Development Programme Phase III site. Overall, open forest area, farm land area and national highway development project phase area were observed to increase by 2.9, 1.7, and 2.1% respectively. Interpretation and conclusion: Our results indicate that LULC changes in the study area were favourable to Anopheles larval development, increasing the risk of the spread of malaria vector habitats and malaria transmission to non-malarious regions of Meghalaya. Background & objectives: Observations and case studies have shown that the number of Visceral Leishmaniasis (VL) cases have increased in the recent years in several areas of Iran including Sarab district, East Azerbaijan province. Sarab district has been considered as a new focus of VL in Iran. The density of the sandfly vector and the Leishmania parasites causing infection has been assessed in 2009. Methods: Sandfly species had been collected from Sarab district, East Azerbaijan province in 2009 using sticky papers and CDC traps. DNA of sandflies was extracted and nested PCR was amplified in a region of the ribosomal RNA amplicon of Leishmania (ITS1-5.8S rRNA gene), which was shown to be species-specific by DNA sequence. Results: Altogether, 1317 male and female sandflies were trapped. At least 10 different sandfly species were identified morphologically. Leishmania infantum was the only Leishmania that was detected among the sandfly's population in Sarab district. All the infectious cases (4/223) found in the abundant sandfly region were Phlebotomus kandelakii. Conclusion: The diversity of sandflies was similar to those in the main VL focal points in Iran, but the diversity of parasite and density were significantly lower. The low prevalence of VL in Sarab district might be explained by the scarcity of infected domestic dogs Canis familiaris the primary reservoir host of VL in the region. By finding the L. infantum in P. kandelakii for the first time on this new focus, we are able to conclude that P. kandelakii might be the vector of L. infantum. In future, more works should be done to test status of P. kandelakii as a proven vector of L. infantum. Background & objectives: Crimean-Congo hemorrhagic fever (CCHF) is a viral infection typically transmitted by tick bite. This study is to define the level of heparan sulphate (HS) in serum/urine since HS may play a role in the pathogenesis of hemorrhagic events in the patients with CCHF. Methods: In this study, the patient group consisted of 79 cases with a positive diagnosis of CCHF according to PCR/ELISA outcome among the patients referred to Cumhuriyet University, School of Medicine in 2010. A total of 81 volunteers who had not any viral or metabolic disease were enrolled as the control group. The blood samples were centrifuged, and the serum and urine samples obtained were stored at – 80°C until they were studied. Then, these samples were simultaneously dissolved, and HS level was spectrophotometrically measured using glycosaminoglycans specific 1– 9, dimethyl-methylene blue (DMMB) stain. Results: A statistically significant increase in the HSserum values was found both in the individuals under and above 16 yr old in the patient groups compared to the controls (p <0.05). Also there was a statistically significant increase in the urine levels of HS in the cases >16 yr old compared to the controls (p <0.05). Interpretations & conclusion: Increase of the serum/urine levels of HS was though to be due to vascular endothelium damage and to liver injury as well as vascular endothelium damage in the patients who died. Further, comprehensive studies are needed to demonstrate whether the serum/urine levels of HS are correlated to liver and vascular endothelium damage and prognosis of the disease.